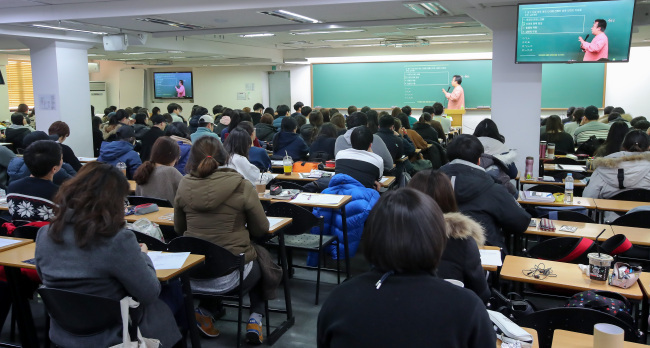 More than half of Korean parents believe their financial abilities affect the education environment of their children, a poll revealed Monday. According to a survey conducted by English education institute, Yoons English School, 78.7 percent of the 616 respondents said the social status of a household influences the education of the children living there. When asked to choose one factor that affects their children’s education the most, 56.5 percent, or 348 respondents, said it was the economic strength of the parents. Another 50 percent, or 313 parents, said they felt social inequality while attending school events or observing their children’s school life. Ninety percent of the 313 respondents also said they felt they did not match up to parents who are better-off. Asked what they envy most about well-off parents, 67 percent of those polled said it was their ability to invest in their children’s private education. Another 60.6 percent said they envied them because they were able to provide the best clothing, food and shelter for their children, while 56 percent said they were envious because such parents could provide overseas experiences for their kids.